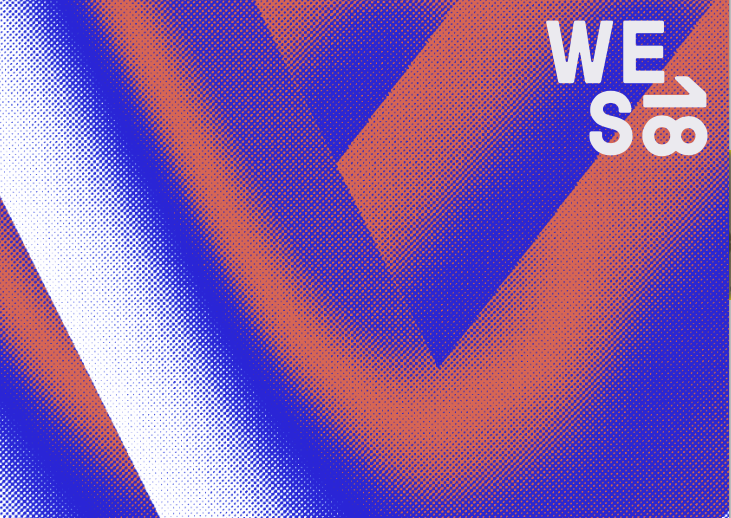 For the next couple of days we will be working at Watt En Schlick Festival again. This year we will be working on 3 different Installations. Keep yourself updated on our Instagram Account. Pretty Mery K presents their last EP “Big brown eyes” released last year. INRA will play their debut release ′′Suburbs Of Utopia′′. The night will be complete with selected tracks from Saal crew. In their last EP, “Big brown Eyes”, Pretty Mery K makes their sound of the trio more special than before: the gloomy elegance of the songs, their hardly to be denied melancholy, the clearly perceptible but never exaggerated. INRA is a duo project by Adam Ben Nun and Philipp Rhensius (Kl.ne aka aphtc): an attempt to bend time, shape worlds and vaporize our hyperreal surroundings. They use a just intonation guitar that shifts between pure overtones and a mass of a harmonic substance, drums, field recordings, and poetry to conjure a viscous yet danceable, meditative yet nervous sound. Drawing from club music, free improvisation, drone, dub and sonic futurism they exhale an alienated ontology, haunted by the presence of the real and memories of the future. 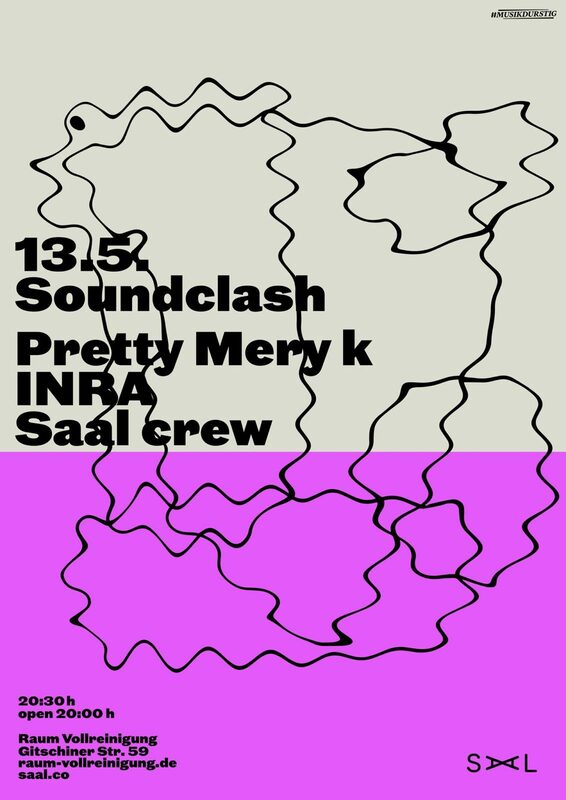 Saal crew will close the night with selected tracks. What’s good? What’s popping? What’s cracking? So another year on this spaceship called Earth is in the bag. I’m sure all of you will agree that 2016 was one hell of a year! What kept us moving and our spirits strong was the fact that no matter where we went, we met like minded individuals with a wealth of soul and creativity. People who not only believe in the power of Art in shaping reality, but live it day in day out. And it’s during all of these functions and meetings that we felt that we were a part of a perfect world, and in that sense, we always are. How we treat each other, the beauty we create together and smuggle into this bleak reality, is the alternative to this madness. And on that note we would like to wish you all a HAPPY NEW YEAR 2017. 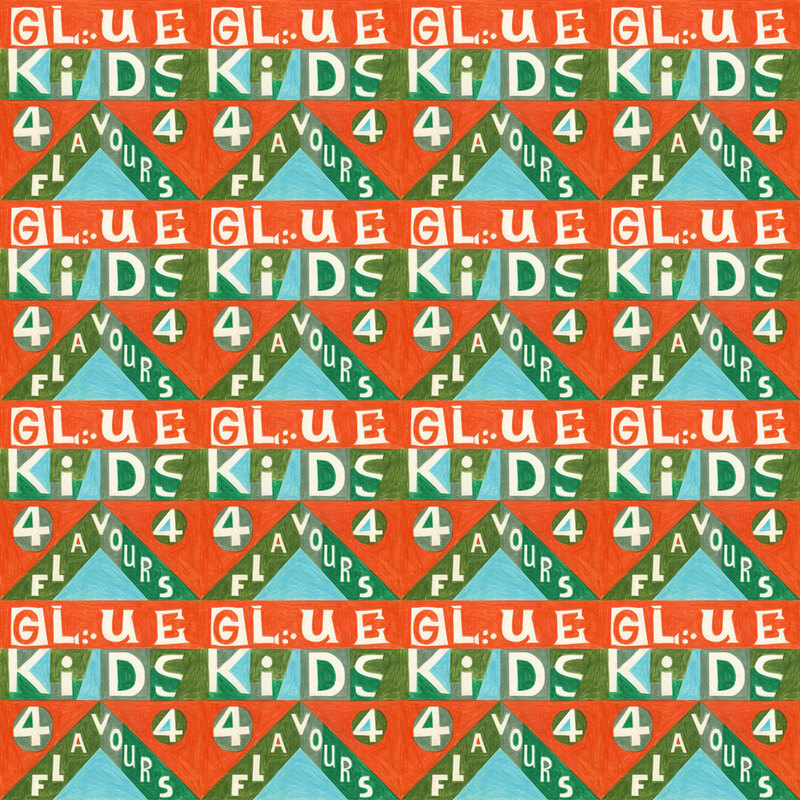 And as our tradition dictates, we have a beautiful mixtape for you, put together by our dear friend The Glue Kids. Actually, it’s not really a mixtape, but a deep journey of sorts. We are happy to be invited to be part of ”BRÜTEN FÜNF” in Mannheim together with our friend Jim Avignon. We will show our Halma show in the beautiful Off Space of Team The Team. Please feel welcome to come by on friday the 3rd of june 2016 for a mask workshop at 3pm or the exhibtion opening with a Neoangin live concert at 8pm to Pozzistr.7. BRÜTEN – und zwar gemeinsam. In der Neckarstadt-Ost ensteht ein neuer Raum für Kunstaktionen, Gespräche, Lecture-Performances und Akkustische Konzerte. BRÜTEN lädt einmal im Monat ein zur unterhaltsamen und interaktiven Auseinandersetzung mit Popkultur und kreativen Schaffensprozessen. Wie? Das hängt immer wieder neu von Euch allen ab, Publikum und eingeladenen Künstlern. BRÜTEN ist für Kinder und Erwachsene, Familien, Kollegen, Freunde und Verwandte. In zwei Blöcken wird gebrütet: Ab 15 Uhr ist das Familiencafé geöffnet mit frisch Gebrühtem und frisch ausgebrüteten Kunstaktionen, die sich speziell an Kinder und Familien richten und bei denen alle mitmachen können. Ab 20 Uhr brüten wir über jeweils ein musikalisches Thema. Wir laden Musiker ein oder geben einen spannenden Vortrag, zeigen Filme oder tanzen und performen live für Euch. Wir bekommen Besuch aus Berlin von gleich zwei spannenden bildenden Künstlern. Julio Rölle von 44flavours und Jim Avignon. Was macht man mit Künstlern? Richtig, auf jeden Fall eine Ausstellung. 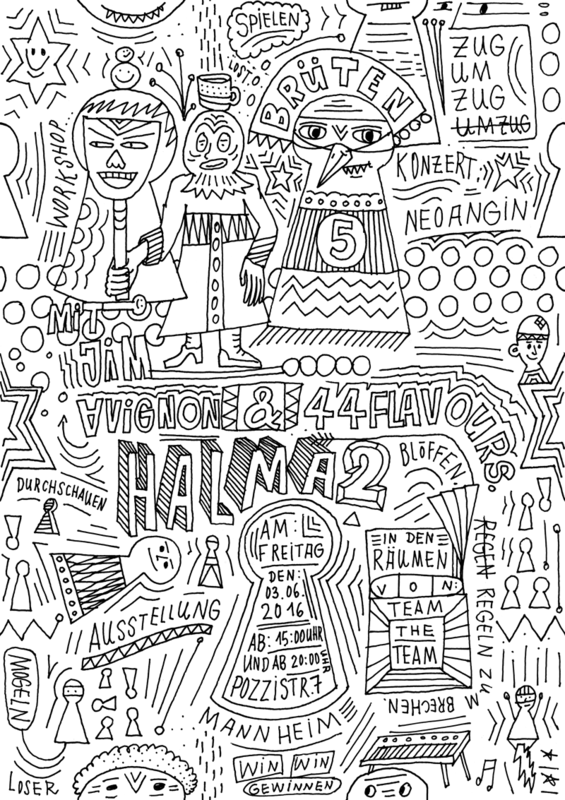 Im vergangenen Herbst haben das Künstlerduo Sebastian Bagge & Julio Rölle, bekannt unter dem Namen 44flavours, gemeinsam mit Jim Avignon gemalt, gestaltet und etwas besonderes ausgebrütet. Entstanden ist eine wunderbare Ausstellung mit dem Titel & Thema Halma, die in Frankfurt im Kunstverein Montez Premiere hatte. Nun nutzen wir die Chance und zeigen euch in den Räumen von Team the Team das Werk. Darüber hinaus wollen wir mit euch, euren Kindern und den Künstlern etwas Gemeinsames ausbrüten. In einem Workshop werden wir mit Julio und Jim die Ausstellung um einige Kunstwerke erweitern. Was genau passieren wird, hängt von der Begegnung zwischen uns allen ab. Ab 15 Uhr HALMA MASK BLAST – Jim und Julio werden mit euch in “44 Avignon Jim Flavour” – Manier Masken basteln, so dass wir alle zu Spielfiguren mutieren, die die Ausstellung rund um das Spiel Halma zum Leben erwecken. Ab 20h NEOANGIN – LIVE Am Abend werden wir BRÜTEN FÜNF mit einem Konzert von Jim beginnen, der unter dem Namen Neoangin als Ein Mann Elektronik Band auftritt. Masken und Tanzschuhe bitte mitbringen.